A handy guide to this year’s mind-boggling liquor-law reform. Utah’s liquor law looks a little like a Swiss cheese after the 2009 Legislature. Big chunks are missing from sections that previously described what a “private club” was and instructed owners how to keep books of “members,” hold an annual meeting and deal with club visitors (“An individual that in accordance with Section 32A-5-107 holds limited privileges in a private club by virtue of a visitor card”). However, for all the language scratched out for bars, lawmakers inserted new wording that Utah’s restaurants will have to figure out. New provisions remove drink-mixing to back rooms and restrict under-21s from some areas. Although, “a minor may momentarily pass by a grandfathered bar structure, en route to an area of a restaurant liquor licensee’s premises in which the minor is permitted to be.” There is no mention of whether the under-21-year-old is supposed to avert his or her eyes while passing the Chili’s bar counter. Here is a quick glance of the dos and don’ts of the new world of Utah liquor law. Each year, all of Utah’s private club licenses expire at the end of June. When owners get new licenses July 1, they will be public bars, known simply as “clubs” in the new law. No memberships and no membership fees are required to enter. The transition in the law is automatic, though, in theory, a club could go through some rigmarole to keep private status. One paragraph in the liquor law rewrite says bars must turn over videotape to law enforcement. However, Bob Brown, owner of Cheers to You (“a private club for members”) says police can’t take the tapes unless they are investigating a crime. The same goes for the information bars are required to collect on some patrons using ID scanners. New ID scanners are required to read the IDs of anyone who “appears” to be less than 35 years old. ID information will reside only in bar’s computers and must be purged after seven days, which Salt Lake City civil rights attor ney Brian Barnard says is much less worrying than an early proposal for a government database. Brown notes that the bar-code reading scanner won’t be able to tell if a minor is using an older sibling’s ID, and doormen will still be required to ferret out fakers. “The scanner is nearly pointless,” he says. “It just is something written in to the law to make people feel good about us getting rid of private clubs.” But it is a goofiness Brown is happy to live with. If someone underage does get inside a bar using a fake ID and is caught, the new law brings down the hammer. The minor loses his or her driver license for one year. If a bar gets fined for letting the minor in, the bar can sue the child or the child’s parents to recover half the fine and attorney’s fees. Driving under the influence penalties are up. First-time offenders will be required to install a breathalyzer on their ignition for 18 months, at a cost of about $1,500, and their licenses will be suspended for 120 days, up from the current 90. Young people who get caught drinking and driving won’t get their driver licenses back until they turn 21. One provision of the new law doubles the so-called “dram shop liability” insurance clubs are required to carry. Bars will have to insure for $2 million against the possibility a customer harms someone and the victim sues the bar. Increased insurance costs will likely be passed along in a bump to drink prices, says Brown. Two proposals from Sen. Scott McCoy, D-Salt Lake City, were included in the omnibus liquor reform bill. Proceeds from keeping state liquor stores open on Election Day, and from the $1 million in savings the state expects to make from no longer putting little “DABC” stickers on liquor bottles will be used to help restaurants pay for remodels needed to comply with the new liquor law. McCoy was told his “Brunch Bill,” which would have allowed restaurants to serve hard liquor at 10 a.m. just like clubs, was a no-go, so he made it into a stand-alone bill that died without a committee hearing. A Bloody Mary with Sunday brunch remains on the list of liquor-reform unfinished business. A bill that would have allowed wholesale sales of kegs of so-called “heavy” beer was left hanging. Restaurants and bars will still have to buy beer stronger than 3.2 percent at the liquor store, just like everyone else. Mark Alston, owner of the Bayou club, says that has two effects. First, a bottle of imported Belgium beer cost $14 at his restaurant. Secondly, the law keeps some of the best Americanmade beer out of Utah. Alston has been working on New Belgium Brewing Company for years to import what many beer geeks consider the best U.S. beer, but the company won’t let its product sit in the unrefrigerated warehouses of the DABC. Beer distributors refrigerate. A sign outside Mark Alston’s home brewing supply shop, Beer Nut, celebrates the Legislature´s legalization of brewing your own beer—76 years after the end of Prohibition. 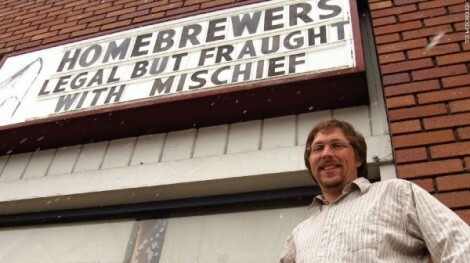 The sign also pokes fun at a comment from Rep. Greg Bell, R-Fruit Heights, who reluctantly voted for legalization saying the hobby was “fraught with mischief.” The old law was never enforced and Alston says the only practical effect of the change will be that Utah’s home-brewing clubs can bring beer-tasting competitions out of the closet. Dave Mahaffey, president of the Zion Zymurgist Homebrew Operative Society (ZZHops) says the change won’t make any difference. “We got to the point of thinking everything in Utah was against the law," he says.